In the heart of Sussex and set in its own open grounds with rolling hills on all sides, our marquee venue at Southdown Gun Club offers the best value wedding package that money can buy. 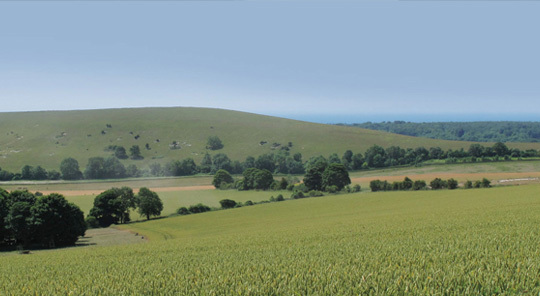 Situated just north of Worthing not far from the lovely village of Findon, West Sussex, our marquee is positioned so as to afford the best views of the valley and glorious sun sets – weather permitting! Shooting at the gun club itself is available on request. The venue can seat up to 150 guests – yet a smaller wedding party won’t feel lost by the use of clever partitioning. The Clearspan marquee – able to cope comfortably with the temperamental British weather – is fitted out with the very best equipment and furnishings including elegantly pleated ivory linings and chandelier lighting. Furniture includes round tables, trestle tables and comfortable padded chairs while a carpeted, solid wooden floor gives the feel of luxury to you and your guests’ toes so you can dance the night away on the dance floor! We understand you will want to add your own individual touches – like a bar area and UV lighting, an interior theme or decorations in our photos above – and we will endeavour to provide any optional extras you require so that your dream wedding remains affordable.